To help me with my VR job hunt, I’ve just put up a portfolio/career website for myself at http://dcoetzee.com. It’s very basic, just a WordPress site with the default theme, but it’s clean and works nicely across devices. I refer to LinkedIn for my resume, since they have a nice builder interface, and refer to this blog for the gritty details of my projects. People keep asking what settings I run to get good performance in my videos of The Legend of Zelda: Wind Waker running in Dolphin VR, the fork of the Dolphin Gamecube emulator with support for the Oculus Rift DK2 (see my YouTube playlist for this game). I don’t know for sure which settings are important as I haven’t experimented with everything, but here is what I have at the moment, and I currently get a high-quality experience with no serious artifacts and smooth head tracking about 90% of the time. In order to force the reader to focus upon the current word, but still be able to take advantage of information in their peripheral vision, we apply a blur to all words other than the current one. 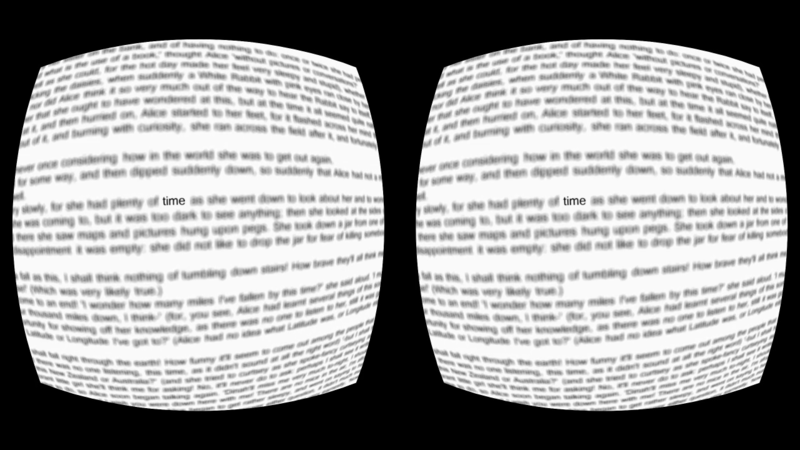 The blur is relatively subtle when not looking directly at the words, but very noticeable when they are brought into the fovea. This was fairly straightforward and efficient – most of the delay in implementing it was diagnosing the Unity 5 bug mentioned in the previous post. The basic idea is borrowed from this Gamedev StackExchange post, which suggested using DepthMask. The principal is to render two quads, one with the sharp text, and right in front of it, another with the blurry text. Between rendering the sharp and the blurry quad, I render a special masking quad, which is located in front of both quads, but only renders to the depth buffer, not the color buffers. The result is that the front quad does not write any pixels to the locations where the masking quad is found. This allows me to mask any portion of the document I choose by simply moving the masking quad to that location. In the screenshot/video below the blur effect is exaggerated for emphasis – in reality it would probably be preferable to have it be less severe. 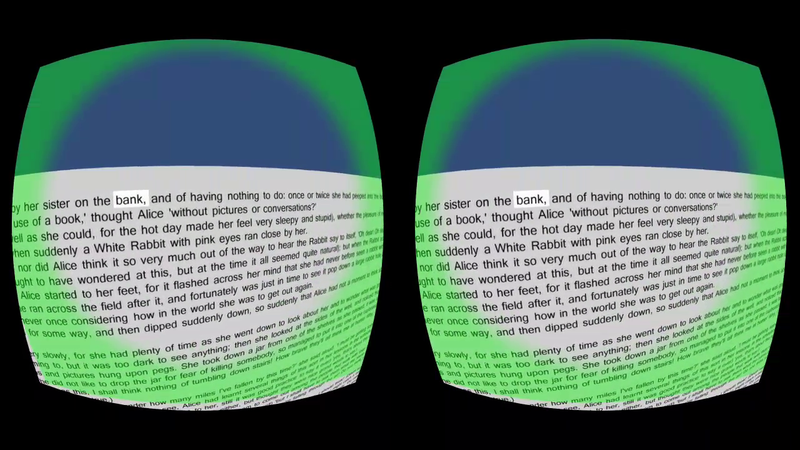 I experimented with moving my head while reading, and as expected the counter-rotation of my eyes continued to track the selected word in the text with no issue. I was creating a simple application for Gear VR in Unity 5.x which was encountering a strange bug where after two seconds it would stop working. Eventually I boiled it down to a minimal reproducing scene that looks like this: This is a very simple scene: it contains two quads that have two different 4096×4096 textures applied to them, compressed with ETC2 (GLES 3.0). There are no other objects and no active scripts or shaders. Everything else is disabled. When I run it in the Unity editor, the result is what you would expect: the two quads just sit there, with their two different textures, indefinitely. 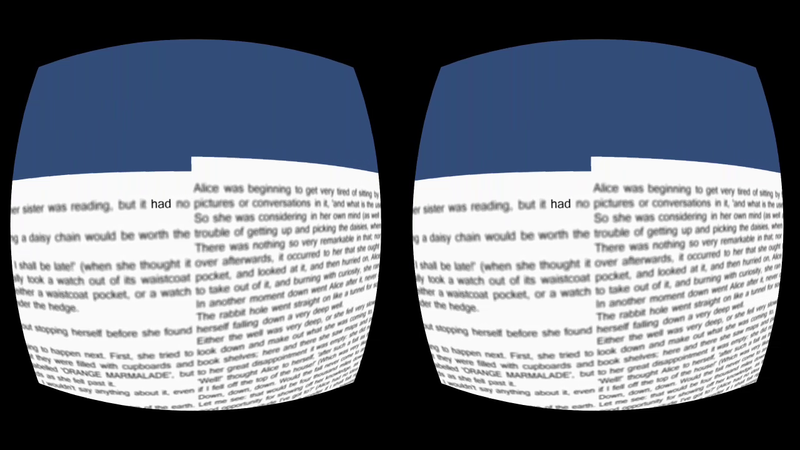 When I build and run the same app on Gear VR on the Note 4, a mysterious and inexplicable event occurs: the app runs correctly for 2 seconds, and then the quad in the back magically changes to have the same texture as the quad in the front! Recall that there are no scripts running. If I disable the quad in the front, this behavior does not occur. Just to be sure, I re-created the quad in front from scratch, to make sure it had no implicit link to the other. The behavior still occurs. After downgrading to Unity 4.x, this behavior vanished and it worked as expected. 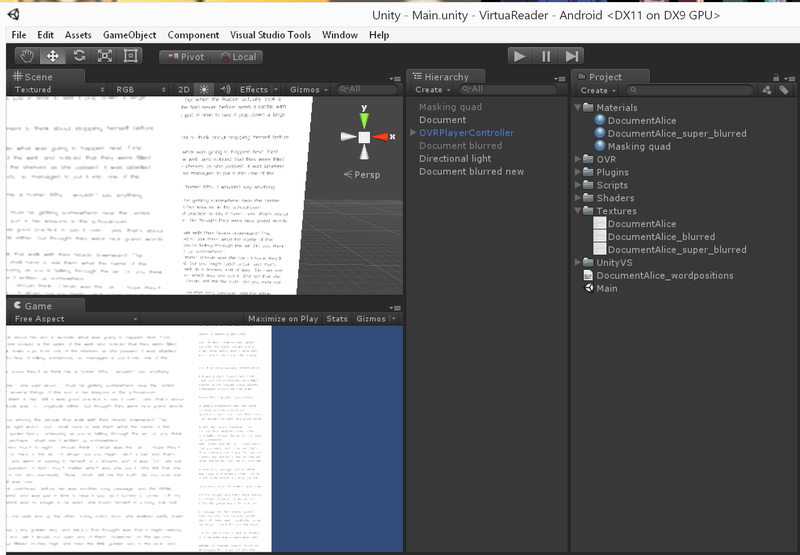 So it’s most likely some kind of Unity 5 bug. I can only speculate why this occurs. Maybe some internal failure is causing one of the textures to be lost, and so it reverts to the other texture. Maybe it thinks one of the textures has no references, so it’s being garbage collected at the first opportunity. 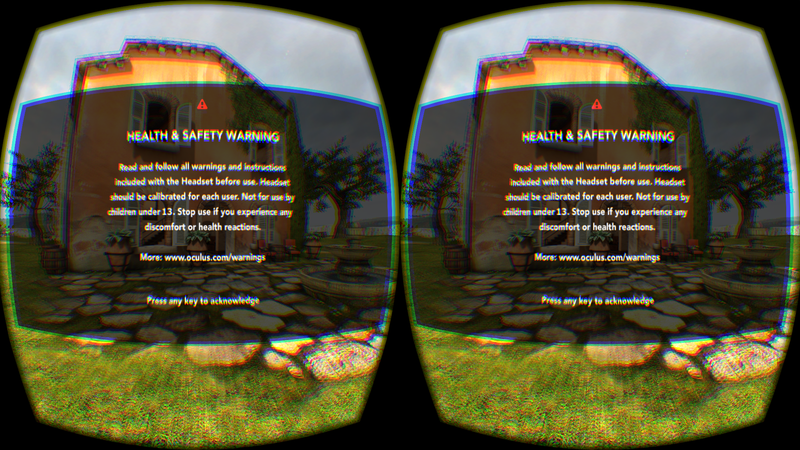 Whatever it is, I should have trusted people who said Unity 5 wasn’t yet safe to use with Gear VR. Edit: Apparently some people are using Unity 5 for Gear VR with fairly sophisticated projects as shown in this guide. I have no idea what the difference is that’s causing them not to hit the same issue – as far as I know I set up the same way.